Jenny McCarthy, Are You Listening? Yesterday, the Lancet retracted a 1988 study that found a link between vaccinations and autism. If you've been even mildly following this debate, you know that this has been coming for a long time. There is absolutely no evidence that vaccinating children causes autism. None. 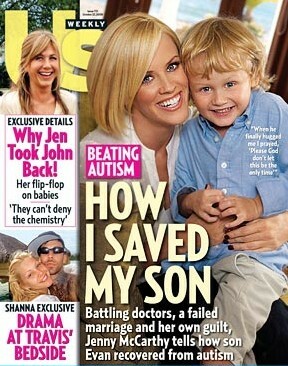 Give it up, Jenny McCarthy. Unfortunately, Moody's statement does seem to evoke Drezner's Eleventh Commandment of Policy Wonks. Activists will argue that this is an example of Big Science suppressing counterintuitive research. And in a public battle between the Jenny McCarthy/Oprah media-industrial complex and a bunch of science nerds, I'm putting my money on Mustard Girl. And I'm not the only one. becoming easier to point out flaws that don't necessarily compromise the basic science but do tarnish the image of scientists as neutral arbiters of fact. Time for another viewing of this movie. Yes, there’s absolutely no evidence of a link between autism and vaccination. That’s been clear for a long while. But, communicating this information has clearly been a really tough nut. As with climate change, though, I think that scientists have to stop calling the people who don’t get it idiots (even when we think they are), and try to figure out how to convince people. Since the vaccine scare reached it’s peak just around when I was vaccinating my own children, I did a bit of reading on how one convinces people. And, what I found was that trust was everything — people didn’t believe data or statistics, because they didn’t understand them. So, they relied on people they trusted (and for some, this is Jenny McCarthy). So scientists need to get people in positions trusted by people on their side (and, these trust-generators need to come from all different parts of the community, occupations, political backgrounds, religious backgrounds, celebrities, etc.) It was a revelation to me, because what seemed to work was so different from what works for me — I could care less about my childrens’ teacher’s positions on immunization, I care a bit about my doctor’s position, but, mostly, I care about the CDC’s position. But for many, the teacher may matter more than everyone else (or the nurse, or the priest, or their sister). And, of course, Oprah. Amanda Peet (about whom I know nothing except this) seems to have been rather good on this. One of the key problems in the UK (where it seems to me that the scare started) was that ministers buggered up public trust over BSE. Once you lose the public trust on these issues, given that people (including journalists) basically don’t understand science or statistical analysis, and entrepreneurs like Jenny McCarthy (whoever she is — never heard of her other than on this issue, either) have such investment in spreading misinformation, eveyrthing is done for. Yes, Peet is a good example. I can’t imagine in my wildest dreams caring what Peet thinks about vaccinations, but I think she’s been effective, more so, even, then some of the scientist-parents with children with autism who leapt into the fray. I think the bloggers who’ve taken positions (Laura, Squid, . . . .) have an effect. I think loosing trust is big, and they’ve nearly done it with me about the gardasil vaccine for young girls. You should rent The Whole Nine Yards. A friend’s son was in college, studying marketing, just before Gardasil came on the market. The son claims the marketing professor predicted the approach perfectly. First, create awareness and panic about the condition. Then, produce your treatment. I think you’d got it backwards, Stranger. HPV has been killing people long before the vaccine ever went on the market. Yes, but we weren’t panicking about it. We were getting pap smears. The marketing trick is to create “awareness and panic.” Awareness seems like a good thing to me. Panic, not so good. That’s where the Gardasil manufacturers annoyed me. Add the lack of a “Caesar’s wife” standard among those supporting the vaccine, and they created a public relations problem. It made me mad, because not only did the issue create concerns about the Gardasil vaccine, it undermined the authority and trust on other vaccines. That just tells you if you’ve already got it. I wasn’t angry at Gardasil’s marketing — I was angry at the people who opposed the vaccine on the grounds that if girls got it there’d be one less way to scare them out of sexual activity. How about at the people who were ticked off about the intrusion into parental rights of making it mandatory for public school girls, as Texas’s Gov. Perry did a few years back? With vaccines and school, the usual argument is that you shouldn’t send an unvaccinated child to school, since they will endanger other children during the school day, but you can’t really make that argument for HPV. I heard an anti-Perry ad from Kay Bailey Hutchinson on the radio just now that brought up the Gardasil thing. KBH has had a brutal series of Perry ads focusing on cronyism. Well, I was super-angry about that. But, I was pretty upset about Gardasil’s marketing, and the apparent complicity of the organizations I normally would cite (to support vaccines) in the marketing campaign. It’s precisely what the anti-vax folks use to justify ignoring the data, and the whole thing made the vaccine battle harder to fight. The same is true for the FOA scandal about climate change in England. When you have people out there who are ready to use anything they can to further their cause, you have to be beyond reproach. If your readers would like to see the range of responses (both supporting Wakefield and applauding the Lancet retraction), I’ve been keeping a list.